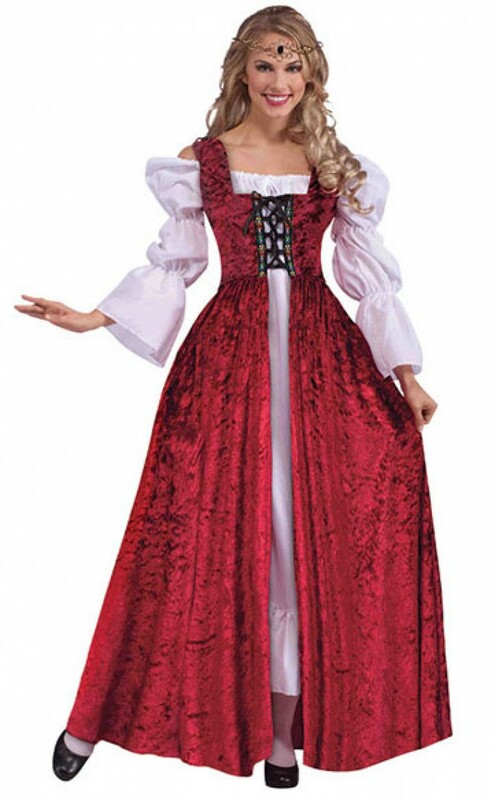 A luxurious red velour medieval fancy dress gown. Perfect for Tudor, Victorian or any ancient times party dress. Rich red lace up gown with embroidered detailing. The gown laces at the front and the arms also tie at the top (black cord included) making sizing across the bust very flexible. The dress is made out of a sumptuous velour material in red and is very soft and slightly stretchy for ultimate comfort and design versatility. The gown is very adaptable and can be worn over any outfit, such as dresses or as more of a jacket to create your own style. The white undergarment (sold separately) is also a great addition. This great outfit suits many ancient times looks including Maid Marion costumes, Victorian and Tudor times or any medieval costume. Size guidelines: One Size (to fit most) UK Size 10-16. The design of the costume also allows for further sizing flexibility. A red lace up gown. The shoes, undergarment and headpiece are pictured for illustration purposes only. The undergarment can be purchased separately.